Over the coming weeks, our new LMP blog will pull and share the vast industry knowledge from our owner, Colin Shane. His in depth knowledge comes from years of experience and hands on training with some of the best printers from Europe. But first let’s touch on where it all began. Colin began Lone Mountain Printing in June 2010, initially as a small clothing brand known as Union Realm Clothing Company, while working at a small screen printing company in Bozeman, MT. Shortly after starting there, the company closed, but by that time it was too late. He already had the drive to keep printing and push forward. In August 2010, with a small loan from his parents, he bought a small screen printing start up package and began printing out of his single car garage. By the summer of 2011, Union Realm Clothing company changed to Lone Mountain Printing and Design with a much larger focus in printing for others rather than his own designs. By early 2014, Lone Mountain Printing started to become what it is today. We moved into our first warehouse after bouncing from available office space to office space and received our first ever 1000 piece order that spring, which is framed and hanging in our office. By late spring, our first 2000 piece order came in, and it was time to automate. We installed our first automatic press, a 2014 Sroque YouXL P12, in August of 2014. During this time, we began our primary focus of printing water based inks. In 2015, we outgrew our warehouse and moved into a 3000 sq ft space. Our first gas dryer was purchased for the production process along with a larger press that allowed for more printheads due to our primary focus in water based printing. The beginning of 2016 began with a special order of a new Roq YouXL P16 12 color. This made printing water based much easier with the ability to add more flash units and more colors when needed. Also in 2016, Colin made his first trip to Europe determined to master water based printing, which marked the beginning of the future for Lone Mountain Printing. In June 2017, Lone Mountain Printing gained another milestone by upgrading our gas dryer to a large unit and installing our second automatic press. By July 2017, the world of waterbased printing changed with the introduction of Virus Inks WOW technology. Even though Lone Mountain Printing had been printing Virus Inks exclusively since spring of 2016, Colin was determined to master the printing method and become a leader in the USA for water based printing. Being at the forefront of innovation led to more growth. By January of 2018, Colin recognized that it was time for Lone Mountain Printing to move on from our home for the past 3 years. After securing a new building and signing on to a wonderful partnership with M&R Equipment, the future was looking bright. Lone Mountain Printing purchased a 14 color Gauntlet 3, a 10 color Stryker Oval, an I-image S CTS printer, and a 6ft wide Sprint 3000 with 16 feet of heat. 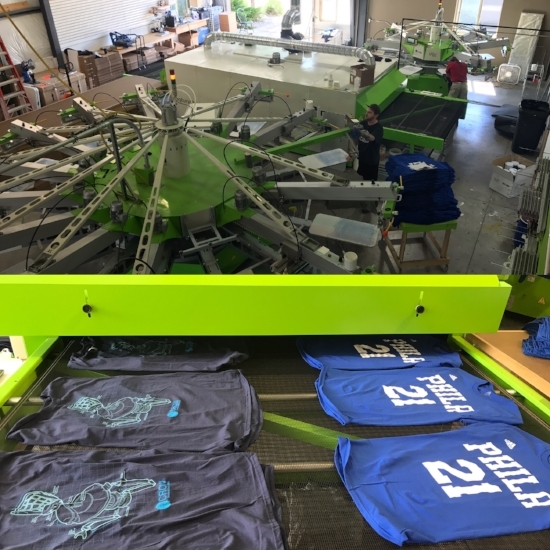 Today, Lone Mountain Printing operates out of 9000 sq ft of space, with a storage capacity to hold 50,000+ garments, an ability of 100,000 imprint monthly capacity, and has become the most advanced screen printing company in Montana. Do you own a graphic tee shirt? Chances are, yes. You are probably wearing one right now or can’t wait to wear your favorite comfy one over the weekend. But the real question is, how can you leverage your brand through custom screen printed shirts? Starting this Wednesday, October 3rd, we will be introducing you to the world of screen printing through the eye of Lone Mountain Printing. This blog is meant to serve as a reference to you for knowledge and better understanding of the process so that you are able to make smart decisions about your shirts when it comes to marketing and branding.